Each issue, Q Fever! presents a challenging clinical conundrum to test readers' problem-solving skills and illustrate bread-and-butter medical principles. Good luck! You are asked to evaluate a 55-year old Caucasian woman who presents to the Emergency Department with the chief complaint of chest pain for several hours. She awoke with the discomfort at 4:00AM today, and it has been a "ten out of ten" since then. The pain is substernal, radiates to her back, and is associated with moderate-to-severe shortness of breath and nausea. No previous such episodes are reported, but the patient states there is a strong family history of cardiac disease, and that she has smoked one-half pack of cigarettes daily for the past thirty-five years. Other than that, she denies past medical or surgical conditions, takes only hormone replacement therapy, and has no known drug allergies. Social history reveals that the patient is married, has three children, and works as an accountant. On physical exam, the patient appears to be in mild discomfort due to chest pain, but otherwise appears normal. Temperature is 97.7F, pulse is 110, blood pressure is 150/100, and respirations are 20. Head and neck, lung, heart, and abdominal exams are normal. An EKG is performed, which shows nonspecific T-wave changes in the lateral leads. Other tests, including troponin-I, cardiac enzymes, and chest x-ray have been performed, but results are still pending. This woman, who presented with severe chest pressure radiating to her back, has an elephant sitting on her chest. The presence of an elephant sitting on the chest is pathognomic for this disorder, and solidifies the diagnosis, which is often missed by clinicians who are not trained in its detection. These mammals can weigh up to five tons, partly accounting for the ensuing discomfort and/or dyspnea when one is sitting on a patient's chest. 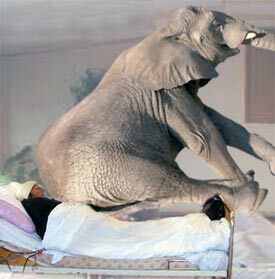 All clinicians must therefore be aware of the possibility of an elephant sitting on the chest in any patient with chest pain and/or dyspnea, and should learn to discern the subtle signs of the condition. These might include: chest pain radiating to the back, shortness of breath, palpitations, nonspecific EKG findings, and the presence of a large gray animal, with floppy ears and a long prehensile nose flanked by curved ivory tusks, sitting on the patient's chest. A strong "wildlife" odor may also be present. Once diagnosed, treatment is simple and fairly straightforward, and involves gently prodding the elephant off the patient's chest with a wooden or metal pole. The patient above had complete resolution of her symptoms within two hours after successful elephant disengagement, and has had no recurrences since. Both she and the elephant were discharged home later that evening.